As you travel along Route 7, you will find a lone building. This building is the Battle Chateau and, when you enter it, you will meet up with Korrina who explains it. This building is filled with trainers that change every few hours. Your task here is to battle the various trainers each day. As you progress, your own personal rank will increase. You start off as a Baron/Baroness, then a Viscount/Viscountess, then Earl/Countess, then Marquis/Marchioness, Duke/Duchess and then finally Grand Duke/Duchess. As you rank up, the Chateau will draw more and more trainers who wish to battle you in each visit. On the odd occassion, a new trainer will enter the building as you're battling through. On the odd occasion when you're at the top level, you may find gym leaders such as Korrina here to battle. These appear once you reach the rank of Marquis/Marchioness. Once you become a Duke/Duchess, the Elite Four start to appear. Writ of Invitation: This writ will send out a request for battles. 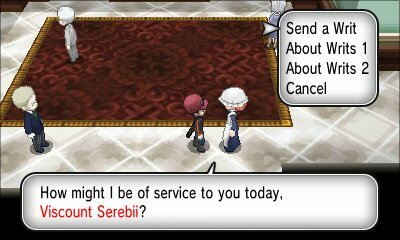 Many more trainers will come into the Chateau over the course of the day to battle you. Silver Writ of Invitation: This writ will send out a request for battles. 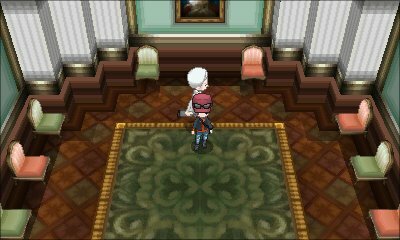 Many more trainers will come into the Chateau over the course of the day to battle you. Gold Writ of Invitation: This writ will send out a request for battles. Many more trainers will come into the Chateau over the course of the day to battle you and increases the money obtained. Writ of Challenge: This writ will cause all the trainers you battle in the day to be of an increased level. All their Pokémon are increased in level by 5. Blue Writ of Challenge: This writ will cause all the trainers you battle in the day to be of a decreased level. All their Pokémon are decreased in level by 5. Red Writ of Challenge: This writ will cause all the trainers you battle in the day to be of a severely increased level. All their Pokémon are increased in level by 10. Black Writ of Challenge: This writ will cause all the trainers you battle in the day to be of a severely increased level. All their Pokémon are increased in level by 20.